Are you looking for the best steel drum band for your Daytona Beach wedding or St. Augustine corporate event? Then look no further than RythmTrail steel drum band! RythmTrail offers steel drum entertainment with a wide variety of calypso, reggae, soca, steel drum music to sooth your soul and transport you and your guests to the Caribbean Islands with their unique and inspiring musical talent. With a huge playlist, over 20 years of experience and the best steel drum players in the state, you can be sure you’re going to get the perfect band for your event or gathering. Whether you need a single steel drum player for your beach wedding or you need an entire steel drum band for your corporate cocktail reception entertainment, RythmTrail has got you covered. If you need RythmTrail for your wedding reception in Daytona Beach, Cocoa Beach or for a birthday party in Melbourne, RythmTrail can and will travel to any location in Florida, the U.S. and even internationally. So what are you waiting for? Ask RythmTrail for a price quote for your venue, gathering or event today! Palm Coast, Ormond Beach, Daytona Beach, Deland, Deltona, New Smyrna Beach, Sanford, Titusville, Cocoa Beach, Merritt Island, Melbourne, Palm Bay, Port Malabar, Sebastian and Vero Beach FLorida. 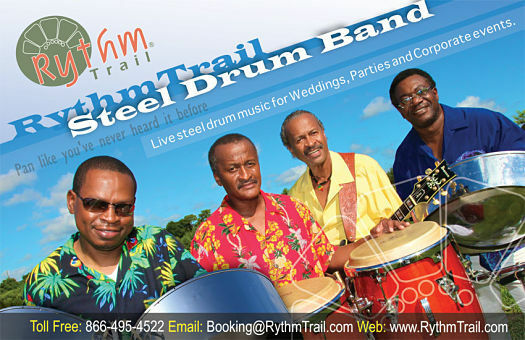 RythmTrail Steel Drum Band was an amazing asset to my wedding. My wedding took place on the beach and it was a great contribution to the wedding. The steel drum player was on time, kind and enthusiastic about playing. He played while the guest were entering as well as leaving. The whole RythmTrail team was easy to work with and very accommodating to my needs. I would highly recommend them to anyone interested!! RythmTrail Steel Drum Band also plays events in Daytona Beach – Cocoa Beach – Melbourne – St Augustine & all other Florida Cities. Book our Steel Drum Band and Steel Drum Players for Beach Weddings, Parties, Corporate Cocktail Receptions and other events in Daytona Beach Florida and Countrywide. We are jamming live steel drum music tonight in Ormond Beach FL for a 60th Birthday Party. Steel Drum Band event update Feb 12 2016. We are playing in Daytona Beach FL tonight, live steel drum music at a wedding rehearsal dinner at Halifax River Yacht Club. Book the best steel drum players for weddings and events in Daytona Beach Florida.